Is Tony Parker the 2nd Best PG EVER?? ~ Roundball Manor - The House that Basketball Built. After 12 NBA seasons, three NBA championships, five All-Star appearances, one Finals MVP, and one win away from his fourth championship, Tony Parker has established himself as one of the all-time great point guards in NBA history. The only point guard with a better resume is Magic Johnson, who has five rings to go with four Finals losses. 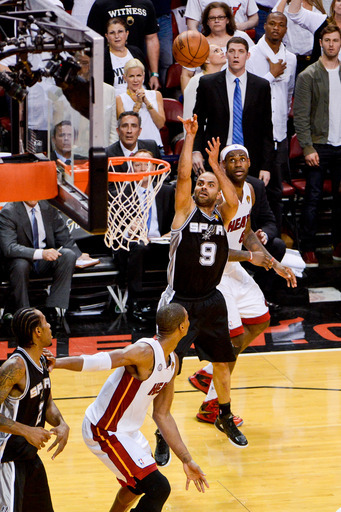 Not sure any other point guard will ever reach nine NBA Finals, but Tony Parker has yet to lose ONE. In fact, under his lead the Spurs have never even TRAILED in a Finals series. That stat alone puts him in a very elite category. At 31 years of age Tony is poised in the prime of his career averaging a career high 7.6 assists to go with 20.3 points per game. Coach Pop has given him the keys to the Bentley this season and he has once again steered it fast and clean to the NBA Finals. He has proven his versatility by leading four very different Spurs teams to the Finals over an 11 year period. His game has continued to develop and he is still surprising teams with his motor, speed, and an uncanny elusiveness to get to the rim. This year guys like Danny Green, Gary Neal, and Tiago Splitter have stepped up as the supporting cast and perfect compliments to a point guard who always seems to find the open man. He still has Tim Duncan for a few more years, so don't expect him to slow down any time soon. He is already the Spurs all-time leader in assists, and if he wins his fourth ring this week he will add a 4-0 undefeated Finals record to his already impressive resume that will help cement him as the second greatest point guard in NBA history.